R and SQL Server are a match made in heaven. You don't need anything special to get started beyond the basic instructions. Once you have jumped the hurdle of reliably and quickly transferring data between R and SQL Server you are ready to discover the power of a relational database when when combined with statistical computing and graphics. In this article I will describe a way to couple SQL Server together with R, and show how we can get a good set of data mining possibilities out of this fusion. First I will introduce R as a statistical / analytical language, then I will show how to get data from and to SQL Server, and lastly I will give a simple example of a data analysis with R.
R is an open source software environment which is used for statistical data analysis. All operations are performed in memory, which means that it is very fast and flexible as long as there is enough memory available. R does not have a storage engine of its own other than the file system, however it uses libraries of drivers to get data from, and send data to, different databases. It is very modular in that there are many libraries which can be downloaded and used for different purposes. Also, there is a rapidly growing community of developers and data scientists which contribute to the library development and to the methods for exploring data and getting value from it. Another great feature is that it has built-in graphical capabilities. With R it takes couple of lines of code to import data from a data source and only one line of code to display a plot graph of the data distribution. An example of this graphical representation will be given shortly. Of course, aside from the built-in graphics, there are libraries which are more advanced in data presentation (ggplot2, for example) and there are even libraries which enable interactive data exploration. For more details on R features and on how to install it, refer to the R Basics article, which was recently published on Simple-talk. This part assumes that the reader has already gained some familiarity with the R environment and has the R and RStudio installed. As mentioned, R does not have its own storage engine, but it relies on other systems to store the analyzed data. In this section we will go through some simple examples on how to couple R with SQL Server’s storage engine and thereby read data from, and write data to, SQL Server. Let’s get busy and setup our R environment. In order to get the connectivity to SQL Server working, first we need to install the packages for the connection method and then we need to load the libraries. Typing ? ?RODBC at the command prompt will bring out some help topics about the RODBC package. For the purpose of this exercise, we will be using the AdventureWorksDW database (it can be downloaded from here). I have divided the Sales and the Annual Sales amounts by a 1000, so it is easier to work with the numbers later on. We will go in details in the statistical analysis later on; let’s start by getting connected. And now we can use this variable as a parameter in the different calls to our database. In the RODBC package there are two different ways to connect to the SQL Server: there are two methods sqlFetch and sqlQuery. As you may have guessed, this is quite flexible if we want to get a subset of the data by using the WHERE clause. 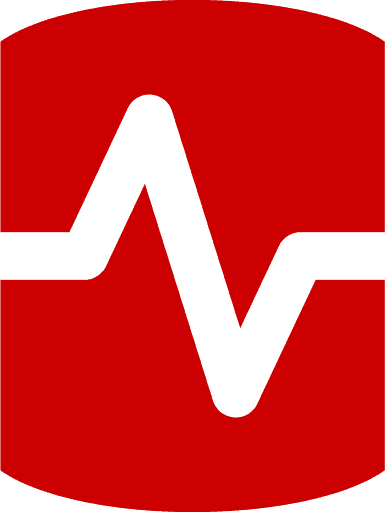 To benchmark the performance of the RODBC library, I have written a script which will read data from SQL Server to R.
The script above creates a connection to a database called TestData. The database has two types of tables – a narrow table with 6 columns and a wide table with 31 columns. The tables are populated with Redgate’s Data Generator, and then the R script above is used to get all data from the respective table and measure the time it took in seconds. Now that we have loaded the data into memory, it is time to explore it. First, let’s see the density and the data distribution. R has great facilities to visualize data almost effortlessly. As we will see shortly, we can call a plot a graph with only a few clicks. Remember that this was the data we loaded for the sales in Euros. 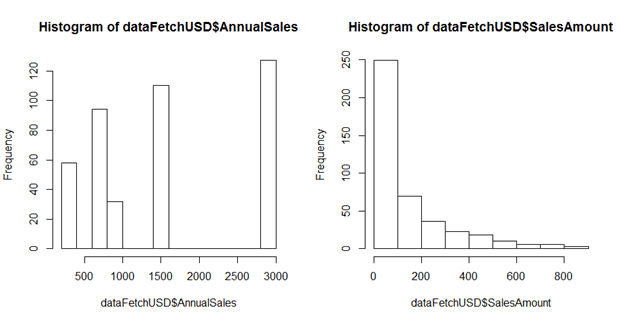 Let’s load the data from USD sales, and compare the histograms. This gives us some more insight into how the resellers perform in the USD market. Now let’s do some clustering to dig a bit deeper in our data. There are countless ways to do Cluster Analysis, and R provides many libraries which do exactly that. There are no best solutions, and it all depends on the purpose of the clustering. Let’s suppose that we want to help our resellers do better in the Euro region, and we have decided to provide them with different marketing tools for doing that, based on their Annual Sales amount. So for this example, the marketing department needs to have the resellers grouped in three groups based on their AnnualSales and the SalesAmount needs to be displayed for each reseller. 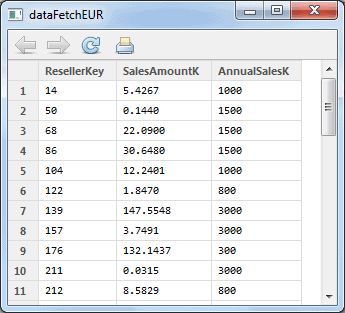 In the example below, we will take the dataFetchEUR dataframe and will divide the resellers in three groups, based on their AnnualSales. Then we will write the data back into our SQL Server Data Warehouse, from where the marketing team will get a report. By looking at the data summary for the AnnualSales column, we can decide to slice the data by the boundaries of 1,000K and 1,600K. These are imaginary boundaries, which in reality will be set by the data scientist after discussions with the team who will be using the data analysis. And now we have a table called [dbo]. [Marketing_EURAnnualSalesCluster] in our [AdventureWorksDW2012] database, which is ready for use by the marketing department. 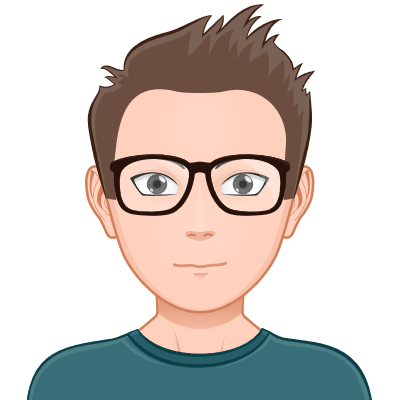 This process can be automated and a batch file can be created with the R scripts – the entire flow from getting the data to writing it back to the data warehouse – and it can be scheduled to be run regularly. 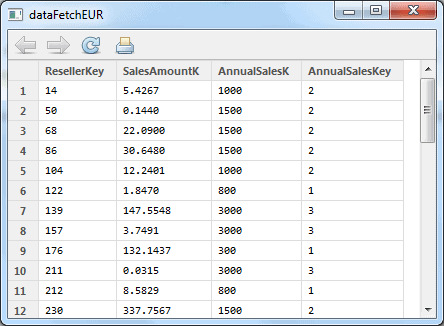 In this article we have seen how easy it is to connect to SQL Server from R and do an exploratory data analysis. This brings great value to business, especially because of the time savings of data modelling and visualization techniques which can be very time consuming with other technologies. 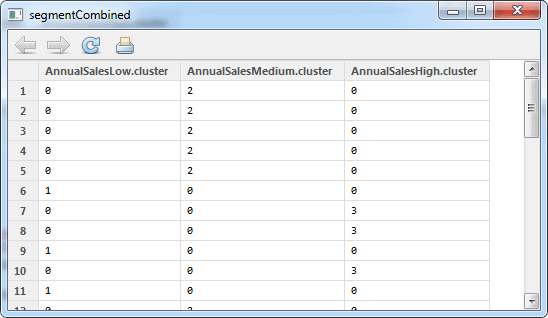 We have explored a way to connect to SQL Server (by using the RODBC library) and we have created a simple Cluster Analysis and segmentation, which provides immediate value to the end-users of the data. Still i am trying to undestand how R benefits SQL Server. The part that’s missing (so far as I know) is the ability to run R routines from within a SQL Server session. Oracle, SAP/HANA, and Postgres/Netezza/any PG derived engine (at least) provide such support. In fact, any DB engine which allows C/C++ as a user defined function/SP language can be so hooked without much effort. Other languages, C# or java, not so much. Anyone who has worked with SQL Server and data analysis for a while will have it in the clear that SQL Server has quite a few costs. We are talking about time and money. The time part is related to data gathering, modelling and writing the reporting part. The money part is the licensing costs of SQL Server – you pay for the hardware and for the software, whereas for R you have only the hardware to pay for. And for R you have no hardware limitations, like you do for SQL Server. (in 2014 you have free Express edition limited to 1GB memory and 10GB data size and max 4 cores, Standard edition is fairly lousy for BI and it costs too much, the Enterprise edition costs 4 times the Standard edition – you get the picture). You are extremely limited in the complexity of statistical analysis that you can do in SQL. It just isn’t designed for this. There rapidly comes a point where it is much easier to do this in R. The huge variety of graphical presentation of the data that you can do in R is a bonus, but I wouldn’t necessarily involve R if you are already using reporting services for this until it becomes necessary. R programming is for data and statistical analysis. SQL sever is for storing data. SQL server database can be used as data source to do analysis. Moreover R programming will become useful with SQL server since Microsoft has bought Revolution Analytics for R programming which will become platform with Microsoft Analytics Platform System appliance and Hadoop for large datawarehouses. 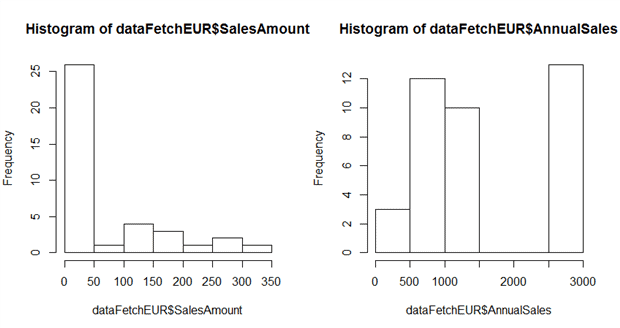 Really nice article and great tutorial for using R with SQL Server. I’ve heard that R will be integrated with SQL Server 2016. I have been studying up on R and have found that it is a quick way to get detailed statistics quickly. Kudos to Feodor! Turns out, Microsoft will be integrating Revolution R.
Doesn’t say whether the hook will work for any version of R, or only the closed version from Revolution. Do R works with SQL Azure? is there a way to connect from SQL server to R?